Tech Support – "But with the Mind"
I am a 27-year-old American who lives with no cable or internet. 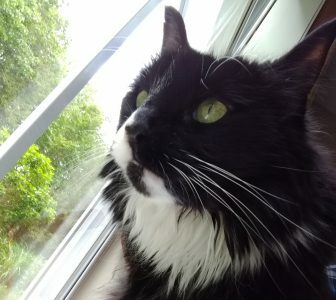 I wouldn’t even own a smartphone if I didn’t need the camera to take pictures of my cat and bird, although I might need to hock it to afford healthcare. I still read paper books, write almost everything out by hand (sometimes with my quill), listen to vinyl, and have been known on occasion to write and read by lantern light. I also think a good old-fashioned barn raising would be just swell. As you can see, I am not the most technologically advanced member of my generation. I do, however, write this fantastic blog on the interwebs. So I am now reaching out for help to anyone in the cyber world willing to lend a hand. I recently installed Snapchat on my soon-to-be hocked phone. I personally have no interest in this app, but several friends use it and one finally encouraged me to join the club. She and her wife are expecting their first child soon and a part of me thought, maybe this is the only way I will be included in their secret club to see pictures of the newborn. The other part of me thought, oh, that’s a great excuse and I sound so human when I am really holding out for the pictures of their dog. After having the app for a week, the only feature I have mastered is the built in Shazam. Technology aside, my main concerns are focused on etiquette. Please help me address the do’s and don’ts of Snapchat etiquette. What the hell do you “Snap?” Is it perfectly acceptable to take a picture of your grandma at her wake with dog ears? If someone sends you something, is it necessary to reply? I know the app lets the sender know when it has been viewed, but that doesn’t exactly offer the personal touch that might be required. Like a thank you card. Or a fruit basket. Okay, so we are replying. What precisely are we to reply? Do we one up their video of skydiving with a rainbow coming out of their mouth? Or do we just send an equally frightening video back giving a thumbs up with a halo and wings that turn to flame and horns? Is it a faux pas to use the chat feature…to chat? Who controls the Snapchat server? Where are my memories really being stored? Is this The Giver? Is this the new way in which IMF contacts its agents? As always, should you or any of your team be caught or killed, the secretary will disavow any knowledge of your actions. This snap will self-destruct within 24 hours. Finally, how do I encourage my friends to send more animal snaps? Like maybe a dog with the dog ears filter. Thank you all for the help and maybe some day I will venture into the land of the Instagram.